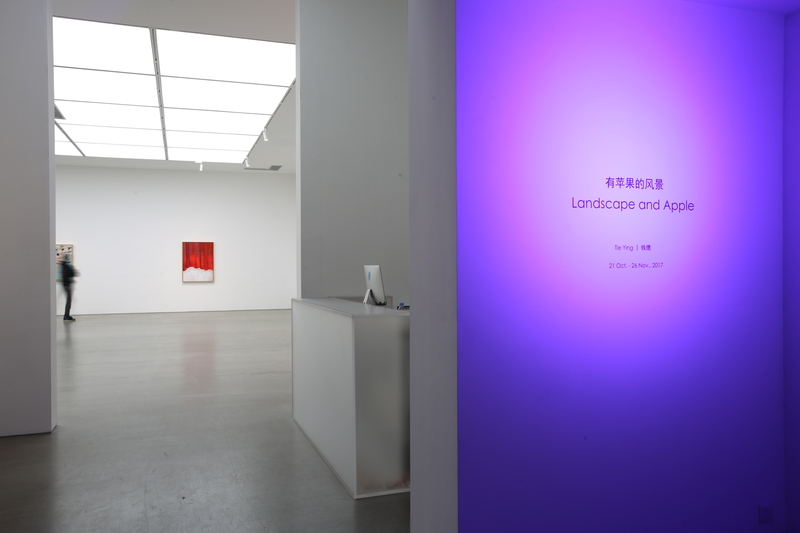 Boers-Li Gallery is pleased to present artist Tie Ying’s debut solo exhibition with the gallery, “Landscape and Apple”. 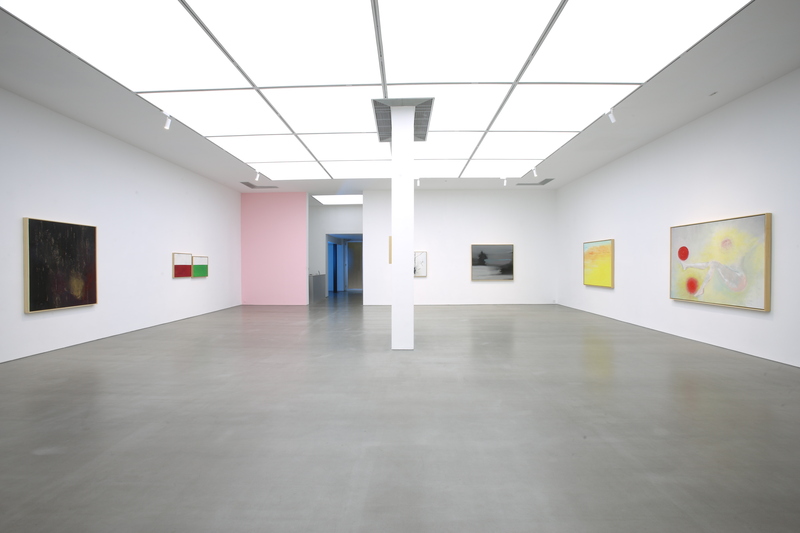 On view are the works primarily completed over the last three years. 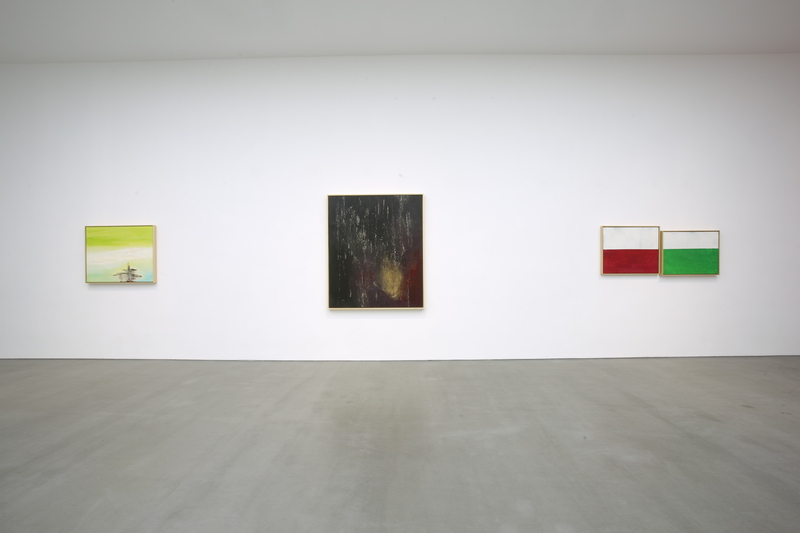 As an outstanding artist of the 1970s generation, Tie Ying’s artistic practice expands in the mediums of painting and photography. In spite of his profound knowledge on Chinese and Western art histories, Tie Ying has always kept the vigilance from appropriating extant visual traditions, so he wouldn’t fall into the trap of self-defining tropes, prosaic iconography or trite methodologies. The artist consciously and constantly adjusting his composition on canvas to evade the definitive. Tie Ying’s paintings are proactive acts of liberating our visual experiences from the pictorial syntax we have become immune to. 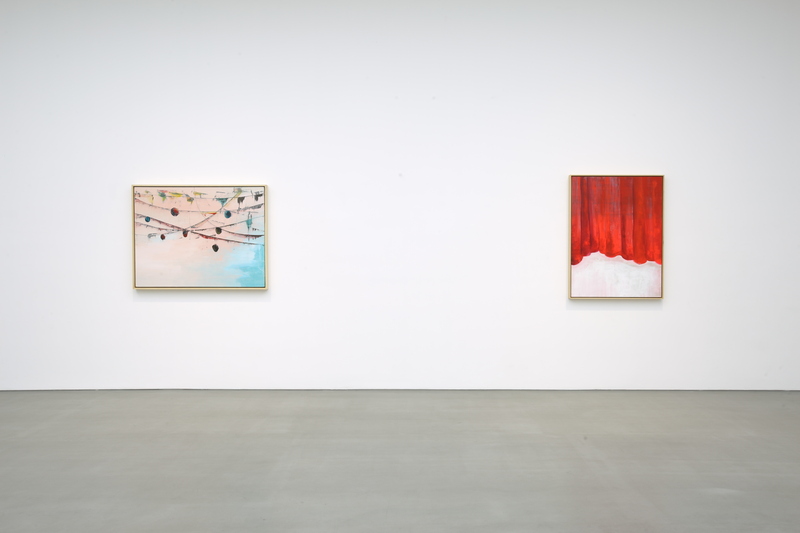 By disconnecting the classic scenes traditionally related to one another, and reducing image making to the piecing together of seemingly unrelated fragmental components, each painting is given a more independent existence. The conglomeration of these visual cues encapsulates the experiences of the contemporary, giving atemporality its configuration. In the artist’s words, they are the “threshold” that renews and evolves with their perception. 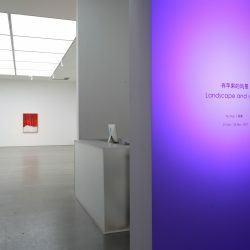 The exhibition uses one of the work "Landscape and Apple" as the show-title. 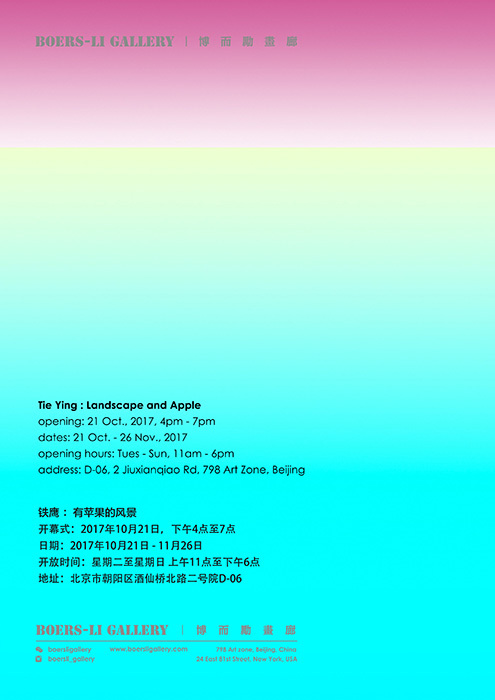 To Tie Ying, apple is perceived as human's lust for things while landscape symbolizes the deeper feelings throughout time. 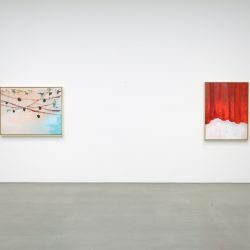 In the work "Landscape and Apple", a hand reaches out with an apple against a backdrop image of what seems to be the Statue of Liberty, and the crimson curtain that drapes on the stage covers over pencil sketches of scattered apples in pastel white. These imageries do not necessarily amount to the notion of the apple or the landscape. To the artist, the apple represents human desire; the landscape is more or less a kind of sensibility. 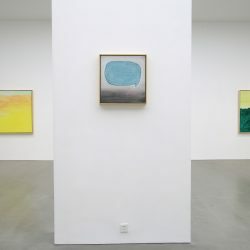 “Landscape and Apple” is ultimately a serious joke, an oxymoron, piecing together the fragments captured in time; a number of imageries consist of narratives absent of any subjectivity, in a contradictory yet complacent world. What one perceives from these images is equally in flux and fragmented, that engenders a continuation of evolving significance. Tie Ying, born in Harbin, China in 1971. In the early 1990s, He was enrolled in classes of advanced studies in the oil painting department of the Central Academy of Fine Art. 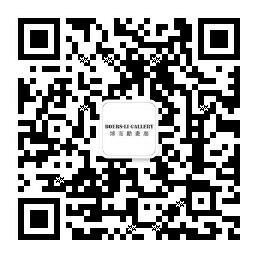 Tie Ying held his first solo exhibition, “Morass of Reverie” at the CAFA Art Gallery in 1994. 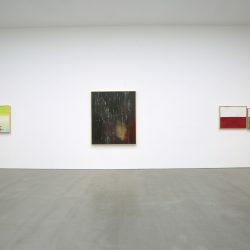 In 1996, as a visiting scholar, he studied at the Royal Institute of Art in Stockholm, Sweden. In the early 2000, Tie Ying’s artistic practice expanded to conceptual photography, he was the subject of solo exhibitions in New York, Zurich and Singapore. 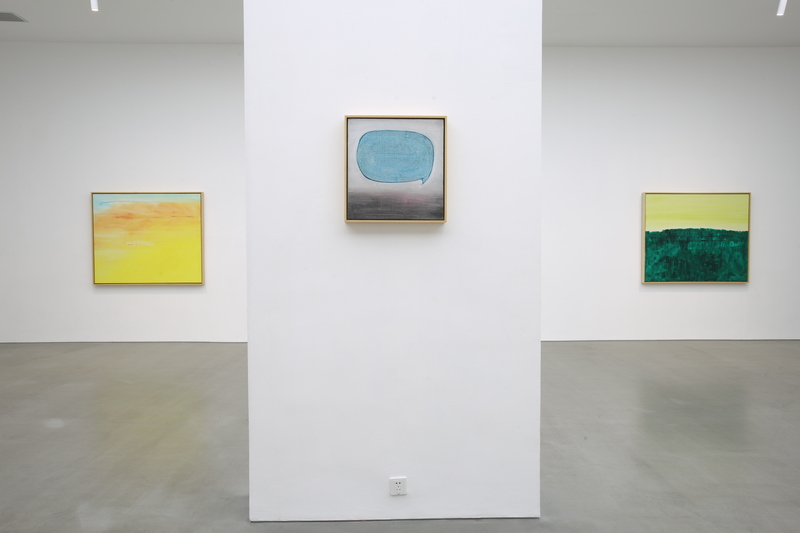 It was not until 2012, Tie Ying returned to oil painting, and continued to explore the possibility of this medium based on his artistic notions. 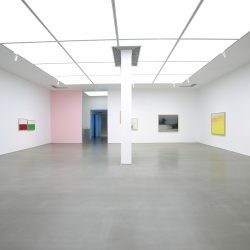 His works are widely collected in China and internationally, including the DSL Collection, the Prince Albert II collection, and other reputable private and public collections.